Teacher Appreciation Week at Belmont! Our teachers ROCK! 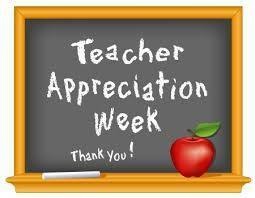 Join us in saying THANK YOU by participating in Teacher Appreciation Week. Monday, April 30-Hats OFF to teachers! Wear your favorite hat! Tuesday, May 01-Teachers make our future BRIGHT! Wear shades or sunglasses! Wednesday, May 02-We’re our teachers’ BIGGEST FANS! Wear your favorite sports team attire! Thursday, May 03-We LOVE our teachers! Wear RED to show your love! Friday, May 04- Write a Thank You note to your teacher. Take a moment to let your teacher know how important he/she is.